Today I wanted to revisit Algebraic equations with my students. I decided to use Andrew Stadel’s Styrofoam Cups 3 Act lesson. The thing I like most about this lesson, is that it has a lot of “hidden math” conversations available- more on that later. I showed my students the video, and asked them to write down 3 questions they had about it. I really stress doing this with 3 Act lessons, student always hit upon what you want them to learn and they have the credit for it! I also like it when I throw up questions and students start to evaluate them and can tell me which ones are similar or even which questions actually answer other questions submitted. 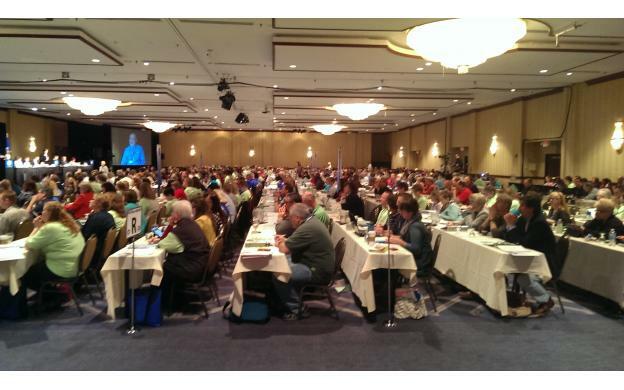 One of the hidden math conversations that I use during this time is questioning: what makes a good question? Since my students have not seen Mr. Stadel before, I can’t even begin to tell you how many questions I got on his appearance; where did he buy that shirt, why is he wearing khakis, who is he, where is he at, do you know him? I am a believer that all questions are good as long as they are asked with a desire to really obtain knowledge. Many of my students were asking these questions because they wanted to gain attention from the class, and we talked about if these were good math questions. Students defined good math questions as ones that focus on what we are trying to learn and how we can solve problems. I was OK with that- I may even make that a mini-lesson next year and create yearly posters on questioning. After we got through the silliness, we got down to business. This is what the board looked like today. Even though there is teacher writing, this was all student driven ideas. I have found that I like students showing WORK on my whiteboard, but for idea expression I need to regulate it to be efficient and on task. The ?’s were ones they finally decided on to be good math questions for the video. 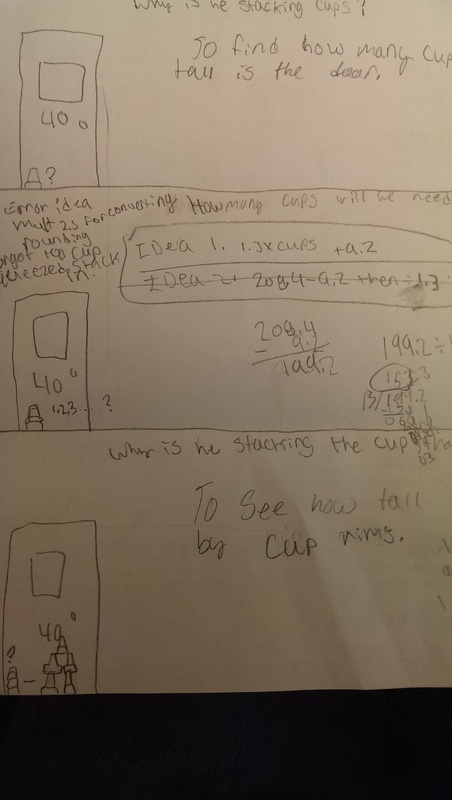 They then wanted diagrams showing the measurements of the cups and door. The first great conversation that came from this video what what measurements we needed to solve this. 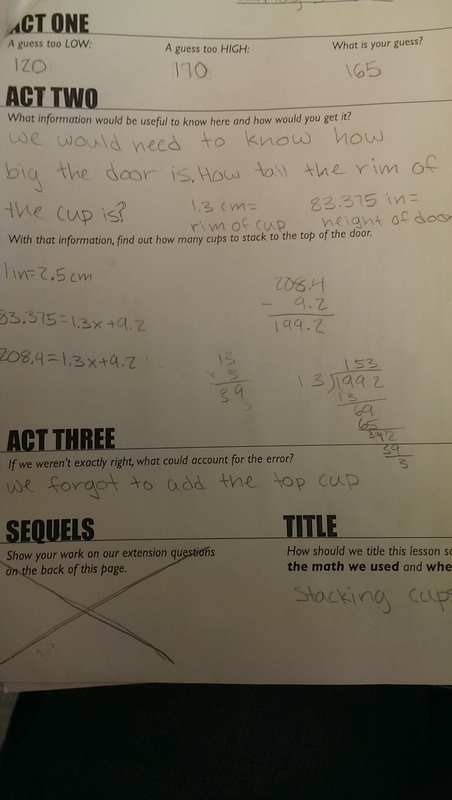 Students needed to know the height of the door and height of the cup, nothing more. When I asked them to take 2 minutes to come up with ideas on how to solve this, a great discussion ensued. I asked my students to relate what their concerns were, and they were confused about the stacking process and how to properly address it. 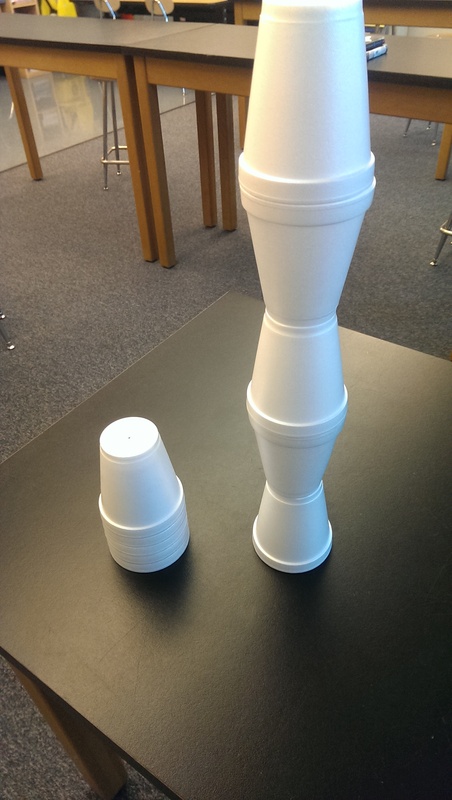 One student showed me this model to represent the difference in stacking cups and the data they were using. 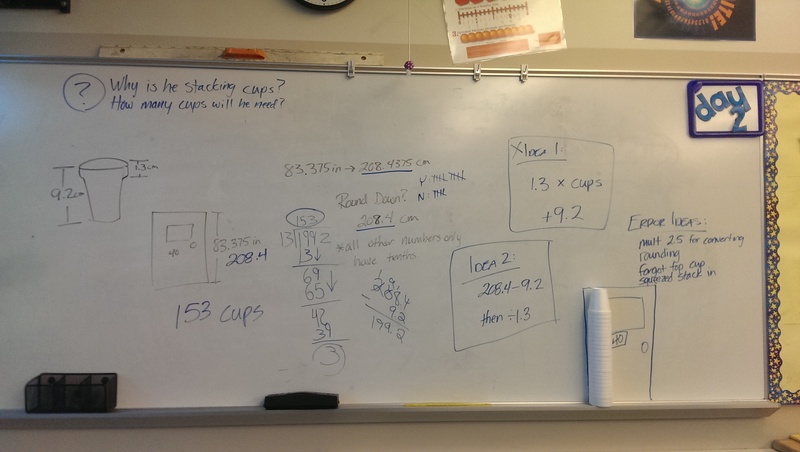 This represented the height of 2 stacks of 5 cups, and students decided they needed the measure of the lip of the cup to continue with the problem. After this discussion another great discussion came about when we looked at units. The cups were in centimeters, the door inches. Students knew they had to do a conversion, but many could not remember what the conversion rate was. One student remembered that it was 2.5cm = 1in so we rolled with that. I knew this would only serve for great discussion for Act 3. The next task was to figure out how many cups would fit in the threshold. As you can see from the whiteboard, there were a couple of variations that students wanted to try. We worked on the first idea for a while, but students realized that this was a guess and check method. They quickly decided that was too much work and I gave them another 2 minutes of partner thinking to come up with a different solution path. Idea 2 is one that I have struggled with all year. Students take formal algebraic equations and convey them in simple terms using basic operations. None of my students considered writing an equation to model the situation, most just knew what steps they needed to solve the problem. We have struggled with this concept all year, they are great with “fill in the blank” or “empty box” expressions, but those darn X’s. Cognitively some students are not ready for that type of representation. After they solve this problem, as a class we go back and formalize the notation- and I will also show them how their solution method connects to the properties of equality in generating a solution. One side-note here, when we start in the solution process many students start complaining about the long decimal in the height. 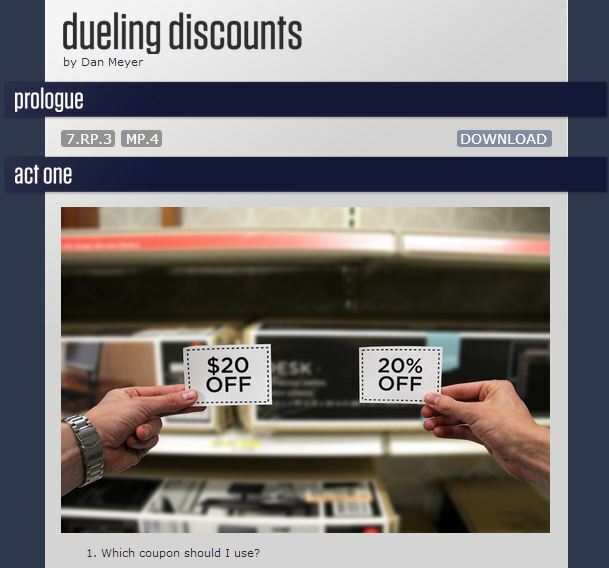 This generates another good conversation about precision and what is appropriate to use. Even though students may not believe it, they have a great feel for what precision is. Here are some student samples of work. 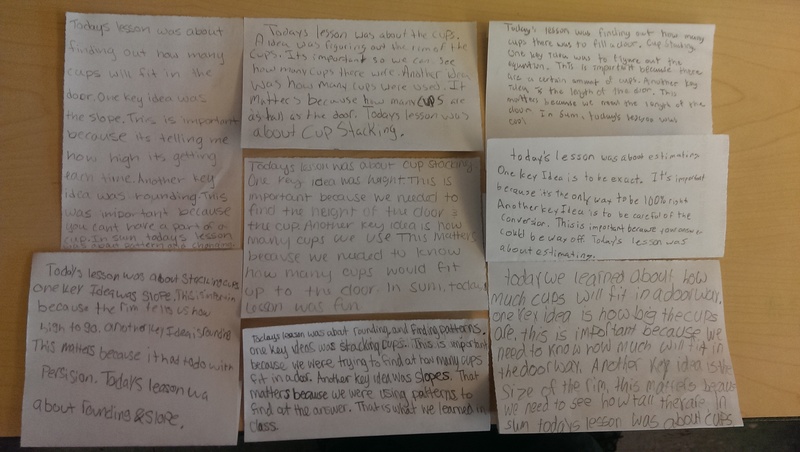 A couple of things to note, students forgot to add the last cup on the stack back into their answer. 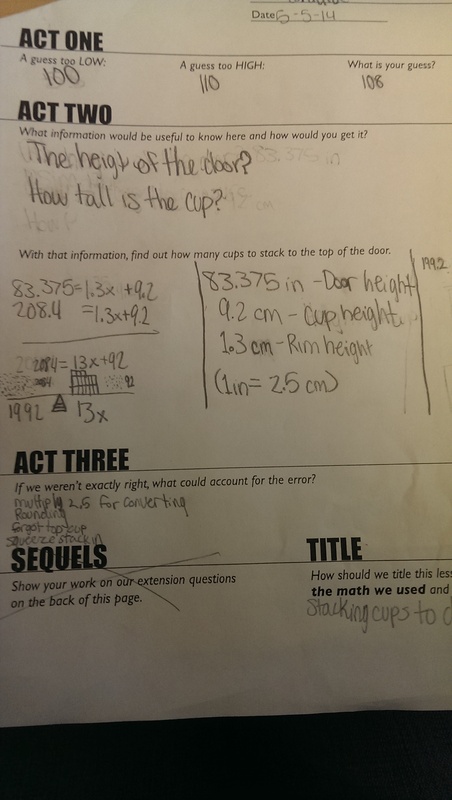 When they did the math, they envisioned the cups at the pattern, or 1.3. Out of all the errors to find this one proved to be the most elusive. This really gives me an idea of what students took away from the lesson. Some were very superficial, claiming the height of the door and cup height were key ideas. Others connected the rim as a slope or pattern of the activity. Other students focused on the rounding and unit conversion as important things. Even though the main focus of this lesson was linear models, each student gave me a different perspective of what they noticed during it. I will go back tomorrow and have a review of what we did and the mathematics involved, and as a class we will fill out a reflection form. We will practice linear problems, and I will hit them up the next day to see what things truly stuck in their learning. What do you think of when you watch this video?